General information for people intending to camp at Santa Pod Raceway. Camping is included in multi-day ticket prices - no extra fee. 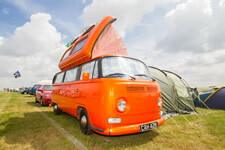 Camping is available at any event that sells a weekend, 2 day or 4 day ticket. Camping is only available for the night/s that the ticket covers. Camping is next to vehicles. Campers are directed through to next available area upon arrival. No electrical hookups are available. Camping is in fields, no hard standing is available. There are showers and toilets on site (small charge for showers). 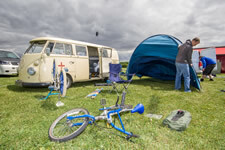 At larger events, a family camping area is available for people with young children, allocated on a first come first served basis. Ask on gate for a family camping sticker. Caravans, motor homes, trailer tents and tents are all allowed. No unauthorised vehicles, i.e. quads, mini-motos. No driving around site past 9pm. No music, loud disruption past 11pm. Day tickets are valid 8am - 6pm (or until racing finishes). Multi day tickets access is from 8am on the first day to 8pm on the last day. Camping is not available on the last day of the ticket. Generators must be turned off between 11pm and 8am, organizers reserve the right to request generators be turned off at any time if deemed to be disturbing other campers. Fires & BBQs - Absolutely no open fires allowed. Only contained fires raised off the ground are permitted. This may include e.g. firepits, chimineas etc. BBQs are welcome but must be off the grass, on something safe. After use let them cool properly and please dispose appropriately. If any fire or container is thought to present a risk of damage to the grass, then we may ask you to stop using it! Anyone found to be collecting wood from Santa Pod or adjoining private land will be ejected from the event. Customers must purchase a ticket for the entire event to be able to camp as Camplify RVs are not available for single day ticket holders. Large high spec motorhomes available for any events, delivered ready to Santa Pod Raceway. The ultimate luxury mobile home experience for you from start to finish. 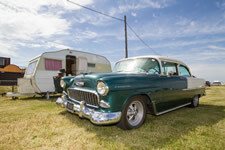 An extensive fleet of American RVs, motorhomes, trailers and fifth wheelers for hire. The on-site team will get everything ready for you, hook up your services, stock the cupboards and make your beds. All you have to do is turn up, check in and enjoy the event. At larger events, we can even arrange for our staff to come in every day and tidy up, make the beds and stock up your cupboards and fridge. Pre-pitched tents or glamping tents at Santa Pod Raceway are available from Pillow at the following events.